Corsair has announced the launch of the Commander PRO and Lighting Node PRO fan and lighting controllers, alongside its new HD140 RGB series of RGB cooling fans. The two controller devices work with Corsair LINK software so you can control their functionality simply. Meanwhile Corsair's new 140mm fans boast 12 vibrant individually addressable RGB LEDs and can be controlled via either of the two new hardware controllers and Corsair LINK. The Corsair Commander PRO (£62.99) is the headlining product launch of the trio. According to Coirsair it offers "the ultimate in Corsair LINK system control". As such it is capable of complete control of your PC's cooling, monitoring, and lighting, as long as they are compatible with LINK. The device accommodates two RGB lighting channels (up to six fans or four LED lighting strips per channel). 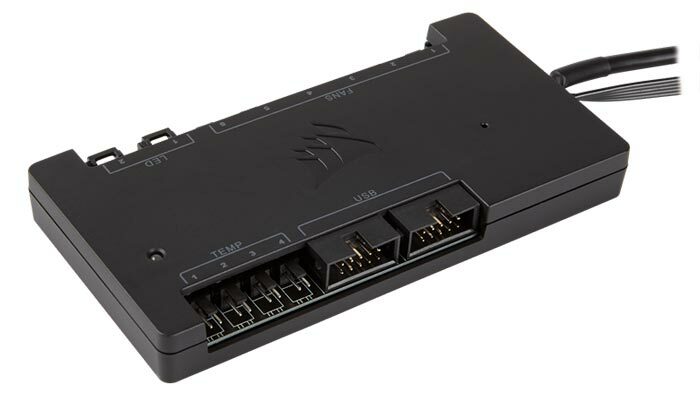 You can also see there are six 4-pin PWM fan connectors which afford control of system cooling fans "from dead-stop to maximum speed, and anywhere in-between," via Corsair LINK curve controls. For temperature monitoring purposes there are four thermistor inputs. 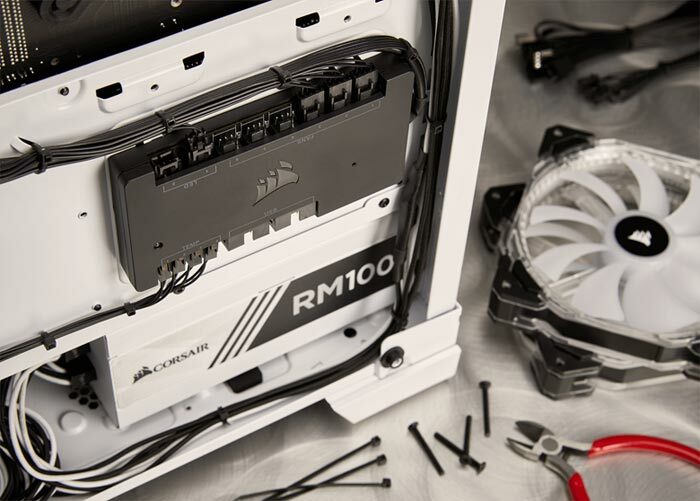 Owners of other Corsair LINK enabled products from AXi, HXi, and RMi PSUs, to CORSAIR Hydro Series liquid CPU coolers, can connect these via the Commander PRO internal USB 2.0 headers, freeing up motherboard connector clutter. As you might expect from the name, the Corsair Lighting Node PRO (£49.99) is all about the control of your RGB LEDs. Thus is offers even more impressive support than the Commander PRO above. This compact device provides vivid lighting effects and custom colour combinations for up to twelve Corsair SP RGB or HD RGB fans (six per channel) or eight Corsair RGB Lighting strips (four per channel). 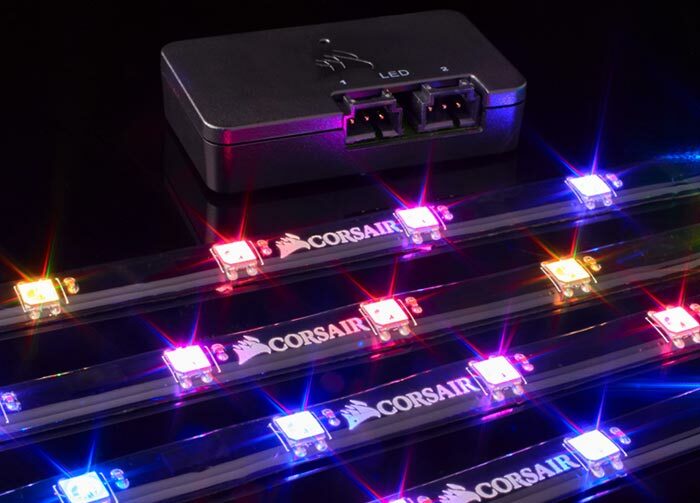 In the pack with this controller Corsair has bundled four individually addressable RGB LED lighting strips (with extension cables), each equipped with ten ultra-bright RGB LEDs. Again the power of this device is harnessed by firing up Corsair LINK. Corsair has added the HD140 RGB Fans to its 'award winning range'. These fans pack 12 individually addressable LEDs "for 360° of RGB," says Corsair. They work great with either of the above fan and lighting controllers with 4-pin PWM control headers. However, even on their own they can be controlled via an easy-access 3-button controller to cycle through vivid animation presets. The new 140mm fans are designed with low-noise hydraulic bearings and ultra-thin fan blades. 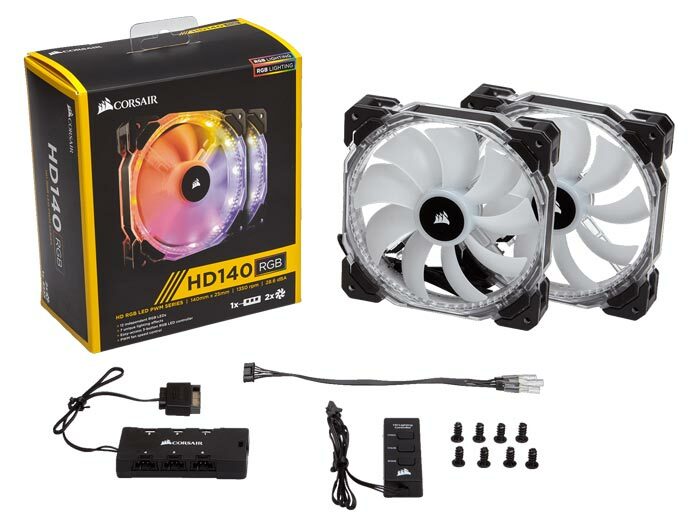 Corsair is selling the HD140 RGB Fans in single (£24.99), and as a twin-pack with controller (£62.99), pictured above. As usual with a Corsair hardware launch the new products are said to be available immediately at your local Corsair stockist - if not try the links in the intro paragraph.